72" diameter spiral stair. Custom spiral stair steps and risers made of plate, no bends. Spiral stair rail system running in a horizontal plane. This spiral stair rail system generally follows the slope of the handrail. Handrail, bottom rail and posts are made from angle iron. Intermediate rails are flat bar, bent the hard way. Spiral stair is built to a height of 13' using a 6" center column and does not need lateral bracing. It is a beautiful contemporary design. Design collaboration was done by builder, homeowner and our staff. Using our fully welded spiral stair system, no design will be out of your reach. At Stairways, Inc., our design capabilities do not stop with the spiral stair components seen on our website or catalog. 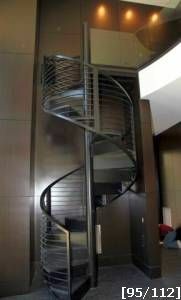 Welded spiral stairs model FAS has endless possibilities. Contact Stairways, Inc. with your ideas. Let us help in the design of a spiral stair that will stand alone in your setting.